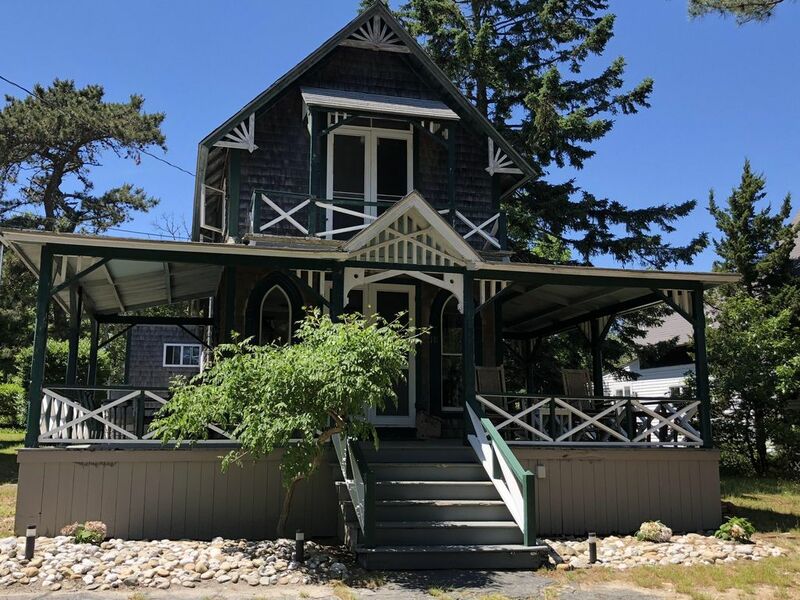 Located on East Chop in a quiet residential neighborhood, this cottage has the same architecture as houses in the historic Oak Bluffs “campgrounds”, but does not have the foot traffic or crowds that visit this area. Enjoy pleasant breakfasts on the large wrap around porch. Then after breakfast, make the easy 7 minute walk to Oak Bluffs with its many casual and fine restaurants as well as the historic harbor. A small public beach, (next to East Chop Beach Club) is a 5 minute walk away. Steamship Authority ferryboat wharf is a 10 minute walk away. Numerous bus routes from Oak Bluffs allow for easy access to the rest of the island. Please note that this rental accepts pets as visitors so if you have K9 allergies this may not be the rental for you. I am sorry the renter was not happy with the house. I have been renting to families via VBRO for 6 years with no complaints. I am proud of my record so I am confused by discontent. The reason being the house had been rented to three other families prior to her arrival and all those renters were happy. I took her complaint seriously so much so I elected to travel to the island to see what I could discover. And what I found bares only a marginal resemblance to her story. Yes the house is old, she and I had a phone call where I specifically told her that the house was old and quaint and she said she understood. Yes there is a moth ball smell and yes there was food in the fridge however it was unopened food. What is so gross about an unopened jar of pickles and an unopened box frozen pizza? Some would consider it a waste to throw away good untouched food. Regarding the dust when I arrived I had to search for any dust. As to “inches” as I mentioned above the house had been rented 3 times prior to her and cleaned 3 times before her arrival. With all those families being there don’t you think someone would have complained about if the house was overrun with dust? Regarding a bedroom with a balcony, the only porch mentioned in the listing is the one on the first floor. Nowhere is the second floor balcony mentioned in the listing because it is not big enough to be considered a true balcony. Additionally the reason for the request to keep off it is for safety. The railing is low and has an open pattern so anyone including kids and dogs can easily get out on the roof. The sign appeared after a dog got out on the roof and jumped off. My additional confusion comes from my contact with here. When we talked the only issues were the dust and the food and her daughter has allergies - nothing else. Only in this review did she mention the electric, which was redone 6 years ago, or balconies or cushions etc.. I really do want all my renters to be satisfied so even though we had a lease which included no refunds I offered to provide the refund since I felt bad about her daughters ‘allergies. My gesture was rewarded with this review. Please see the review for why it was written. We stayed here in the Summer of 2014 for one week. We loved the house. It is a vintage campground cottage. Yes, the furniture is dated but it has a homey feel. My husband grew up on the vineyard and we know what it is like down there. If you are looking for upscale this is not it. Think "shabby chic" The house has everything you need, a nice bathroom, a full kitchen, a nice outdoor shower, nice porch. You can walk and/or bike into OB for dinner. We had a great time! Also Stacy couldn't be nicer.